An elastic waist skirt in three lengths: above-the-knee (20” L), mid-knee (23 1/2” L), and mid-calf (28 1/2” L). Unique sizing and construction make the pattern adaptable to any size. 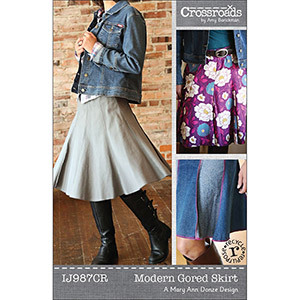 The panels create a skirt that is smooth across the hips with a lower flare. 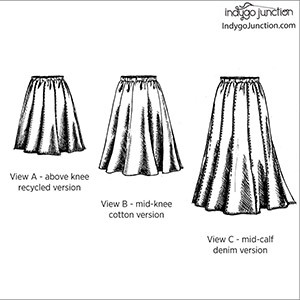 A variety of finishing techniques (serged or traditional seams) are included as well as instructions for creating the skirt with recycled menswear, denim jeans or two alternating fabrics. The pattern is available in waist size 28 1/4" to 56". Suggested fabrics are cotton jersey, vegan leather, ponte de roma, shirting, quilting cotton, and denim.